Compact cart is ideal for presentations. Laptop shelf may be set at seated or standing heights. Works with: Overhead Projector, Laptop Computer, Printer. ECILS2-BK is ideal for presentations that use a data projector and notebook computer. Cart is constructed of steel and rolls easily on casters. The notebook computer shelf can be set at three heights in the standing or seated position. ECILS2M-BK features a three-outlet electrical unit for powering all of your projector and computer equipment. 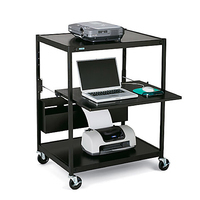 - Top shelf is 42"H and supports a data projector or an overhead projector. - Pull-out notebook computer shelf can be set to seated or standing heights with three adjustments and pulls out on smooth rolling glides. - ECILS2 series carts feature a steel content with 25% to 35% post-consumer recycled steel and are recyclable at the end of the product life cycle. 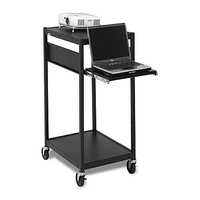 ECILS2 series carts also comply with the GREENGUARD Environmental Institute’s GREENGUARD Children & Schools Indoor Air Quality standards contributing to points toward Leadership in Energy and Environmental Design (LEED) Certification. - 4" Quiet-Glide stem casters, two are locking, are each load rated for 115 lbs. - ECILS2M comes with a 6-outlet electrical assembly with surge suppression that mounts to the top shelf using pre-drilled holes. Features a 20’ grounded power cord and built in cord winder.